Ruling over the land and conquering your enemies for reigning as the SUPREME LEADER is a really childish dream. But there’s no one denying that it sounds cool! Now, think for a moment – how would you feel if you had your own army, your own kingdom and your own base to start and ultimately, rule over the world? Monwar.io gives you the same experience in the cool, exciting world of IO where you get to build your own empire from scratch to the ultimate state. Start your game as the king, build an invincible army and rule over the entire map! The excitement doesn’t end here, I’m afraid. The game also forces you to keep the focus on your resources – both materials and man power and use them wisely. The game is set in a pretty simple, artistic, 2D IO world where you see the entire map from the top view. Despite being so cartoonish, the game itself offers the unique rush of adrenaline while forcing you to be patient. It’s completely on a whole new level in terms of the challenge! Just like any IO game, you start as nothing but a garbage king with a little resource at hand. You use those resources to spawn your first soldiers. All your soldiers will be staying around you – the king, all the time. Now, you’re on a mission of collecting resources from all around the map and developing yourself. There are also a number of legendary warriors sitting here and there. All of them are tough and rough. Do you want them as your soldier? You have to beat them! There are also all those resources – wood, stone, gold and of course, food. The game comes up with quite simple controls. The game is all about strategy. The game design itself will force you to be patient and strategic. Otherwise, you’re doomed. However, each and every single achievement will give you a nice adrenaline rush that will encourage you to grind more and more towards your ultimate goal! 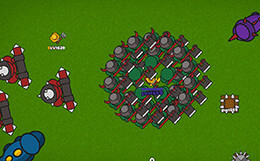 At first, spawn the highest possible units and start gathering all the resources you can. Using the resource, you can spawn more units on the map. In the case of buildings, there are several types. The most important one is the “house”. It determines the size of your army. Build enough of these to house all the soldiers you need to rule the map. Next, it’s time for the resource collectors. While you can gather resources from all around, it’s best to have a safe resource collection ongoing. There are also various defensive buildings. Place them in a way that will protect your base. Once you’ve gathered enough power, defeat the dormant enemies all around the map and make them join your army. With the ultimate army, lead yourself to become the strongest ruler of the map!